I was searching for party planning ideas online yesterday and stumbled across these adorable little handmade wire hangers from LilaFrances. I mean, we all know that wire hangers can quickly deform even the most durable of garments, but wouldn’t these be cute to display on a laundry room or bathroom door? Or better yet, wouldn't they make presh party favors? 1. For a short name, (4 letters or less), you’ll need 60 inches of wire. You’ll also want to add 10-12 inches for each additional letter in the name. For instance, a hanger for “Beth” would be 60 inches; one for “Leslie” would be 80-82 and so on. 2. 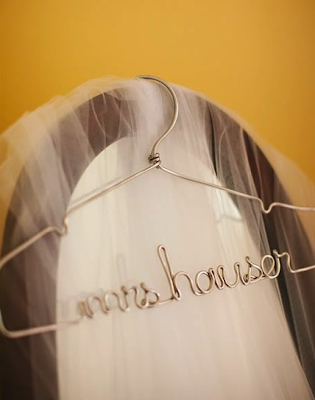 Use the premade wire hanger as your template, but add the little notches for the dress straps to fall. You can do that with the needle nose pliers to bend the wire down and then back up again in a "u" shape. You can basically laid the wire on top of the premade hanger and bent along the curve of it. 3. As for the letters, you can print out some pics from Etsy to see how the letters are made, then draw out the name exactly how it would be done on the hanger. The pictures from Etsy will probably help a lot with some of the more difficult letters. *Just remember, all letters have to be continuous. For this part, you’ll probably use the pliers quite a bit. After you finish the name, simply lay the hanger back on top of the premade one, follow the curve back up to the top and make a notch for the garment strap the same way you did the first one. 4. Finally, bring the wire around the hook portion of the (the part that hangs on the rod in the closet) and twist tightly using your needle nose pliers. 5. Lastly, cut off any excess and tie a cute little bow around it. Voila! 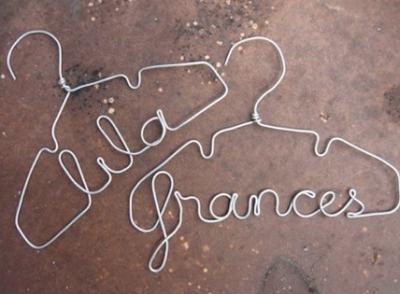 Your very own personalized wire hanger. Words like "galvanized wire" and "pliers" usually send me running for the hills, however this actually looks semi-easy. Like I said, I’ll probably just resort to buying mine online at some point, but who knows? Maybe one of these days I’ll get super ambitious and try making my own. They’re adorable and would be the perfect little gifts to give out at bachelorette parties or baby showers. This is such a sweet idea!!!! I would prolly just buy them rather than attempt to make them - who has this kind of time! cute!!! I'm with you on just buying them! Those are so cute and cool! I'm the same though, I'll never do it myself, but I'd be happy to purchase them if need be! OMG, I love the idea of one for a bride! p.s. Can't wait to see the new look! I ordered one about a month ago for my cousin who is getting married in August! I can't wait to get it...I know she'll love it! LOVE THESE! 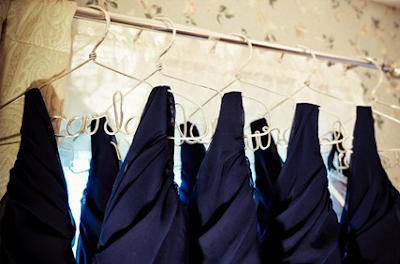 What a cute idea for a wedding dress! So cute for weddings!! thanks for posting! I would love to think I'm crafty enough to make these but I don't think I could! I think they're super cute though! Love these! Might just have to buy a couple for my sister's wedding! Perfect for pics. I love this idea! Definitely keeping this in the memory bank. Adorable! I'm going to have to star this one in my reader, thanks for sharing! Okay! My wife had a friend who just recently received one of these as a bridal shower gift. Now she must have one, too and wants to order some for friends. What exactly is the site? I went to etsy and even tried LilaFrances.com but got absolutely nothing. Where do I go?? PLEEEEEASE share the site to order not make the personalized hangers above so i can surprise my honey with a hanger of her own? ?